The area was cordoned off and nearby homes were evacuated while a bomb disposal team made the device safe this afternoon. 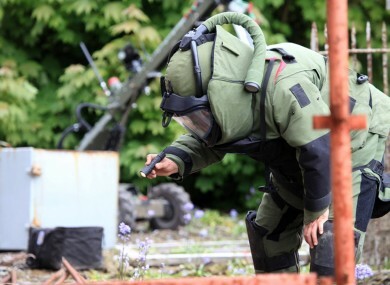 AN ARMY BOMB disposal team rendered safe an improvised explosive device outside a house in Louth this afternoon. They were called to the scene in the Moneymore area of Drogheda by gardaí after a suspect device was found outside the house by a member of the public. A cordon and road closures were put in place and a number of nearby houses were evacuated. The team arrived at 2pm and the device was made safe at the scene without the need for a controlled explosion. It was brought to a secure military location for further examination. All component parts and items of an evidential nature will be handed over to gardaí to assist them with their investigation. The Defence Forces said the scene was declared safe at 2.45pm. There have been more than 25 callouts for the bomb disposal unit to deal with explosive devices so far this year. Email “Explosive device found outside house in Louth”. Feedback on “Explosive device found outside house in Louth”.